I've been living in Greece a few years now, and have travelled all over the country. During that time, I've written hundreds of travel blog posts about Greece. 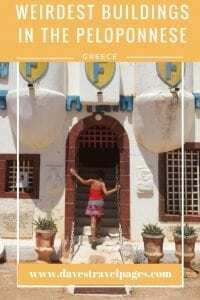 Let me share the best Greece travel guides with you so you can plan your own trip to this beautiful country. 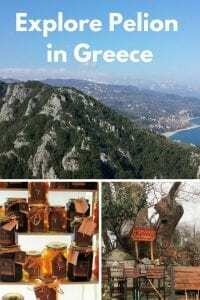 10 Reasons to visit Greece – Some often overlooked reasons why Greece is a great country to take a vacation! Athens is the main point of entry for many people visiting Greece. Whether you are flying into the airport, or arriving by cruise ship at Piraeus, you are going to want to spend a few days in the city. I have a complete section on Athens which you can find here – The Ultimate Guide to Athens. Underneath, I have included what I consider to be the 3 most essential Athens travel guides. 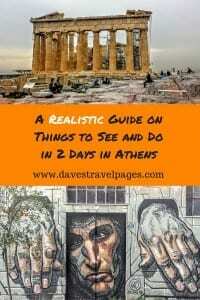 This is my most popular guide to Athens, and the title says it all. Rather than attempting to squeeze every single possible thing into a 2 day itinerary, this takes things at a relaxed pace. 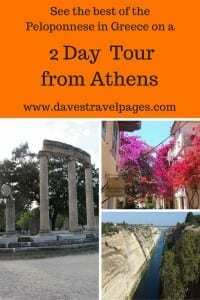 It's easily doable, and enables you to see the essential highlights of Athens in 2 days. If you only plan to be in Athens for a couple of days, staying at one of the hotels near the Acropolis makes sense. You are centrally located and nearby to all the main highlights of the city. 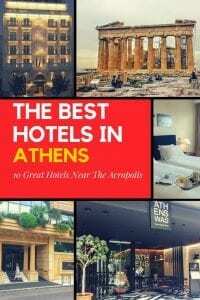 Here, I've picked the best hotels near the Acropolis in Athens. Athens has over 100 museums, and I have nearly visited them all. Clearly, this is beyond the scope of visitors to the city who may have just a few days to explore. 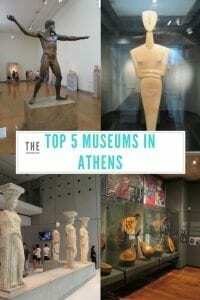 Here's my top 5 museums in Athens to make your life easier. In a rush to visit the Greek islands, many people ignore the Greek mainland. Sure, they may take a day trip to Delphi from Athens, but how many people have heard of the castles of Koroni and Methoni, or the massive archaeological site of Nicopolis? 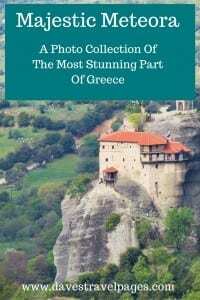 These Greece travel guides to the mainland should help you to discover a whole bunch of places you had previously never heard of. Meteora is just about reachable on a day trip from Athens, but I would suggest spending a couple of days in the area. Take your time exploring the area which includes majestic rock formations and centuries old monasteries. This guide to Meteora should provide all the inspiration you need! There is plenty of accommodation to choose from around Meteora. I've narrowed down the best in this article about where to stay near Meteora. The sunset at Meteora has a magical feel to it. If you are planning a trip there, you should definitely aim to see one if not two! This article about Meteora at sunset explains how to go about it. 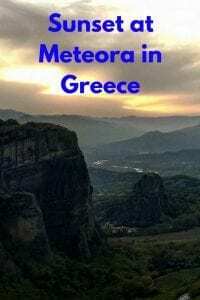 There are also links off to other Greece travel guides about Meteora. I guess it only makes sense that Greece markets its beaches, waters, islands, and Ancient Greek culture as main attractions to the country. There is far more history than that here though, especially in the Peloponnese. Koroni and Methoni castles are two very impressive examples of Venetian fortresses, and you should consider visiting one or the other if you take a vacation in the Peloponnese. You have probably heard of the word Byzantine, but what do you know about the empire? Have you heard of Mystras, a huge walled city in the Peloponnese? Add it onto you itinerary, as you should spend some time there! Find out more here – A guide to Mystras. Ancient Mycenae was one of the most important city states in the Mediterranean during the Bronze Age. There influence stretched far and wide, but along with many other Bronze age civilisations, their society mysteriously collapsed around 1200BC. Today, we have the magnificent ruins of Mycenae, and of course the legends of Troy to entertain us! Find out more about Ancient Mycenae here. Admittedly, you don't get to see much depth on a 2 day tour of the Peloponnese from Athens, but you can tick off some highlights. Cross Corinth canal, visit Ancient Olympia, take a stroll on quiet beaches, and wander through the romantic streets of Nafplion. I actually took some tourists out on this 2 day tour as the driver, so I know it's possible! I also like to think we offered them pretty good value, and a desire to return to Greece again! 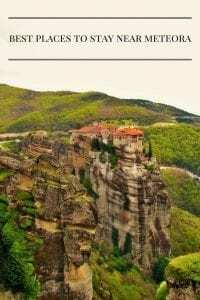 Read more here – 2 day tour to the Peloponnese from Athens. For some reason, the Peloponnese seems to have some pretty weird buildings! There is a fairy tale castle that is in a bad state, a crazy looking church, and a miniature replica of the Eiffel tower dotted around the place! Find out more about the weirdest buildings in the Peloponnese and where to find them. In my humble opinion, Ancient Messene is one of the most impressive ancient sites in Greece. Often overlooked by people who head to the ‘big name' sites, Messene is a vast complex that requires several hours to walk around. If you are planning a road trip through the Peloponnese, you should include a stop here! 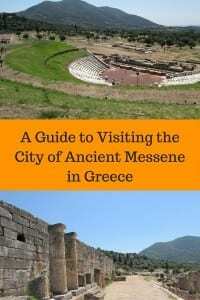 Find out more – Ancient Messene in the Peloponnese. I won't go so far to say that most Athenians have not heard of Nafpaktos, but I will say that not many visit regularly. This is quite strange really, as it makes an ideal weekend break from Athens. 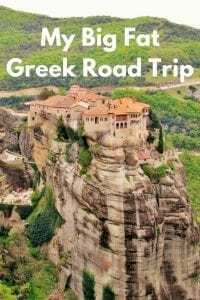 You could also include it on a looping road trip in mainland Greece. 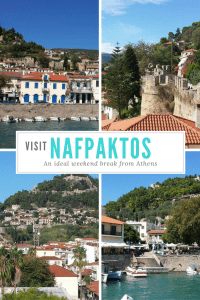 Check out the article on things to do in Nafpaktos, Greece. Pelion is a lovely area to spend a few days. Go in the summer and spend some time on the beach, or visit during the other seasons to take part in outdoor activities. It doesn't really feature highly on the radar of overseas tourists, so you will get more of an authentic Greek experience. Here's what you can do with 2 days in Pelion. Parga is located in the west coast of Greece, and is a beautiful little place to spend a few days. 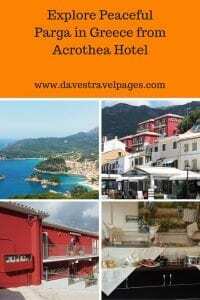 I stopped by here on my cycle tour from Greece to England, and wrote a blog post about what to see and do in Parga. Greece has 227 inhabited islands out of a total of 6000. No, I haven't been to them all! In fact, I haven't had the opportunity yet to write about the 20 or so that I have visited in any great detail. Two of them I have though, and these Greece travel guides to the Greek islands include both Santorini and Crete. Santorini is the most visited Greek island, drawing in people attracted to the air of romance and beautiful surroundings. You've probably seen those photos of whitewashed buildings and blue domed churches. What else is there to see and do though? 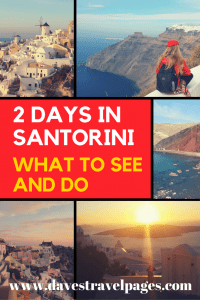 This Greece travel guide to 2 days in Santorini will give you a good base from which to build up your own travel itinerary. 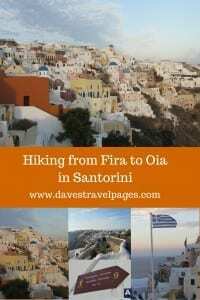 There is a well marked and enjoyable walking route you can follow between Fira and Oia. Anyone with a reasonable level of fitness will enjoy the hike as it winds through villages on a coastal route that takes in amazing views from the Caldera. 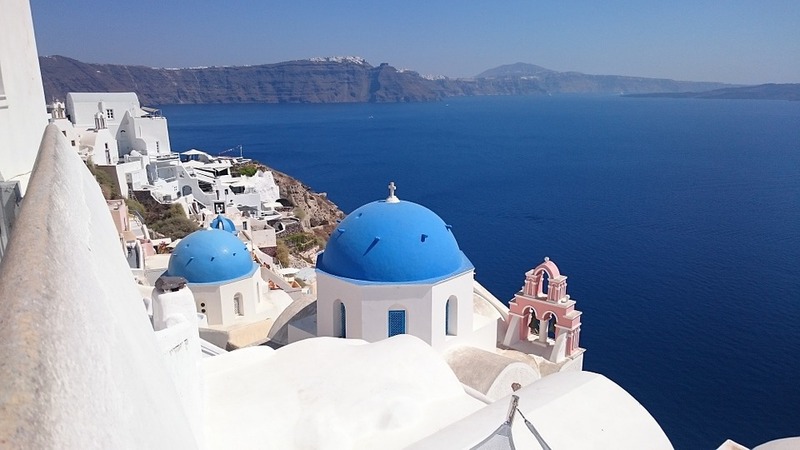 Find out more in this guide to hiking from Fira to Oia in Santorini. Santorini has many famous beaches, with Red Beach being the most famous of all. This guide gives you all the information you need to know about visiting. In my opinion, it is certainly worth visiting to take some photos, but it is not the best beach to actually spend some time on. 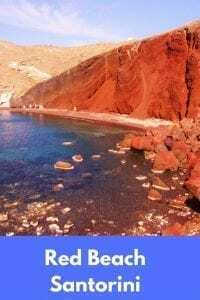 Find out more in this article on Red Beach Santorini. A guide to the Greek island of Patmos. Famous for the Cave of the Apocalypse and Monastery, there is a lot more to this quiet Greek island than meets the eye. It attracts the type of people who appreciate where they are, and want to taste good food, spend time on great beaches, and want to relax in a friendly environment. Crete is almost a country in itself, and so it is difficult to know where to start when planning a trip there! My Greece travel guides to the top 5 Greek experiences in Crete should be a good starting point though. Every first time visitor to Crete is going to want to visit Knossos. Home to the legendary Minotaur, and possibly the famous Labyrinth itself, it is the most famous archaeological site in Crete. 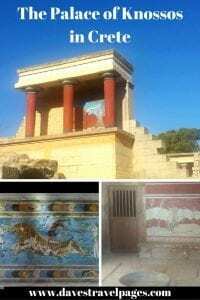 Here are some great tips for visiting the Palace of Knossos. Crete is the perfect Greek island to take a road trip. You can pick off the major attractions in a couple of weeks, but it will still leave you with that feeling there is a lot more to see. Which there is of course! Here's my highlights of a 2 week road trip around Crete. 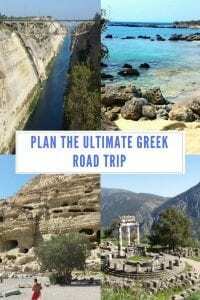 These road trips in Greece could fall under either the mainland Greece travel guides, or the Greek islands ones I suppose, but I think they deserve their own place. If you are planning a road trip in Greece, you should find these useful. These are all based on my own experiences, and I've included the itineraries I followed. If you need any help planning a road trip, just leave a comment at the bottom of the article, and I will answer as soon as I can! If you've read the about Dave Briggs blog post, you will know that I have cycled all over the world. I've not cycled as much as I would like to in Greece, but I'm getting there! In 2016, I cycled from Greece to England, and covered a lot of the west coast of Greece. 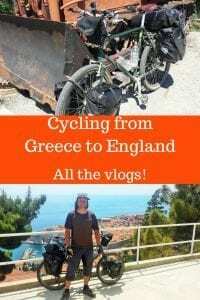 I've put some Greece travel guides on cycling in Greece below in case you to are planning a bicycle tour of your own. Is YouTube your thing? When I cycled from Greece to England, I made a vlog a day during the trip. You are probably going to want to make yourself several cups of tea to get through them all. There is nearly 10 hours of video here!Check out the complete playlist here – Cycling across Europe. 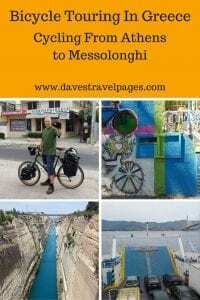 This bicycle touring blog post covers my route cycling from Athens through to Messolonghi. Included in the post are my videos as well as the GPS maps of the routes I took. It might be useful if you are planning to cycle in Greece yourself. This bicycle touring blog post covers the second section of my cycling route through Greece. 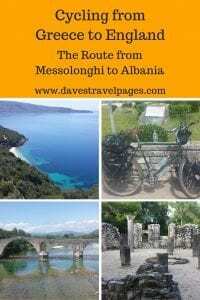 For videos, maps and other information, check out cycling from Messolonghi to Albania. I know this was a big article, but trust me, it still doesn't cover everything! 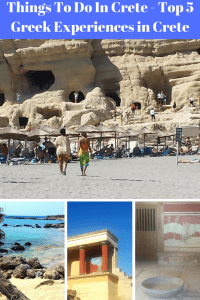 If you would like to stay updated with the latest additions to my free Greece travel guides, and Greek travel related news, please signup for the newsletter through the box. I promise not to spam you, and will only share things I think will help you plan your own trip to Greece.